I have a little recipe book where I keep all my cuttings and family recipes. Its pages are splattered with flour and other ingredients, and some of the pages are even stuck together. Scattered through out this book are mysterious little post its with hand-written and very scant recipes for various Croatian sweeties. Sweeties for recipes that my mum and I love, but find hard to track down. Something you might not know about some people, is that sometimes they don’t share the entire recipe with you. You’ll get enough to get you a good result, but often a little element is left out, that ensures no one will ever make it as good as they do. The complexities of my Croatian side of the family mean that I am the heir to exactly zero Croatian family recipes, privy to no kitchen secrets. I had no grandmother to teach me the tricks of every proud Croatian mother’s kitchen. My mum, from a land as distant and different to Croatia as possible, had to clear her own path to try and make the food of my Dad’s homeland as best she could. She does a fine job too. If it weren’t for her snooping, we wouldn’t have the little post-it notes in the first place. Over the years she’s asked questions to kind individuals about recipes for things like prsurate, blitva and juha. This break in the bridge of an important part of my heritage is why I LOVE The Suburban Peasant blog. Ana is like the virtual cousin I never had and the missing link in my food heritage. She kindly shares the kitchen wisdom of her Croatian family cooking. I am forever grateful that she, along with some other lovely bloggers, are putting these recipes out there to share and celebrate a food culture that is rich in flavour and meaning. Browsing Ana’s blog the other day I saw the recipe for Kroštule, a crispy fried sweet treat that I love but have never dared to make. In the Dalmatian region they call it hrstule. The recipe I have on a post-it note, is a bit different to Ana’s and some other’s I’ve seen on the internet, but it shows the variety that you often get from region to region. Compared to other recipes this one is rather plain, but I think the result is worth sharing. Mix together to form a dough. I needed a little more flour than this recipe called for, so use your common sense. It has to be dense enough to roll out. Break off small chunks, to make for easy rolling. Roll to as thin as possible, the thinner the dough – the crispier the hrstule. 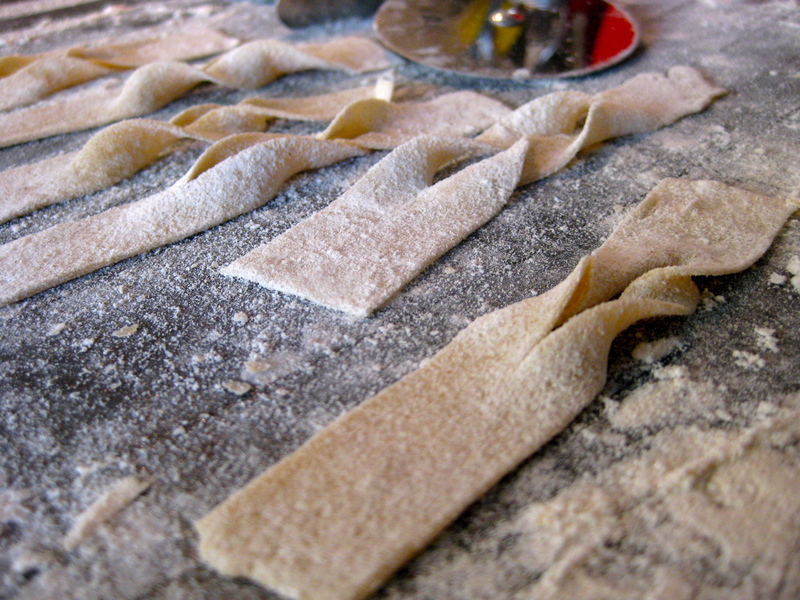 Using a pizza cutter or crimped pastry cutter, cut into long strips, approx 1 inch x 6 inch (2cm x 15cm). Make a 1 inch slit in the middle of each strip. Bring one end of the strip, through the slit and out the other side, gently. Give it a little shake and you’ll get a little twist in the strip. Fry in 180C oil, till golden. Dust with icing sugar while still hot. Aww Lara, thank you for the kind words : ) This is why I love blogging: the people you meet and the “virtual family” you build really can’t be beat. It’s interesting that you call these Hrstule. Which region is your father from? Thank you Ana for sharing your recipes! My dad is from Blato, Korcula, on the Dalmatian coast. I don’t know where this recipe came from or if it is even specific to this area. But the name would be correct for the area I would imagine. I laughed at the comment that there is always something left out of a recipe so no one makes it as good as you! I was listening to the radio yesterday and they were discussing this very issue. One lady rang in to say that many Mums deliberately pass on recipes with a item missing, so that the daughter (perhaps son) will always contact home after they leave to find out what ingredient is missing! A method of ensuring the adult child always remains in touch!! I recently bought an old cook book from a Charity shop and as I opened it, there inside was a pile of handwritten recipes, on pieces of cardboard, paper bags, scraps of paper, shop receipts and it set me thinking of the dear person that this had all belonged to. So much history just by opening that book. I was thrilled with all these wonderful hand me down recipes I had discovered. A bargain indeed! 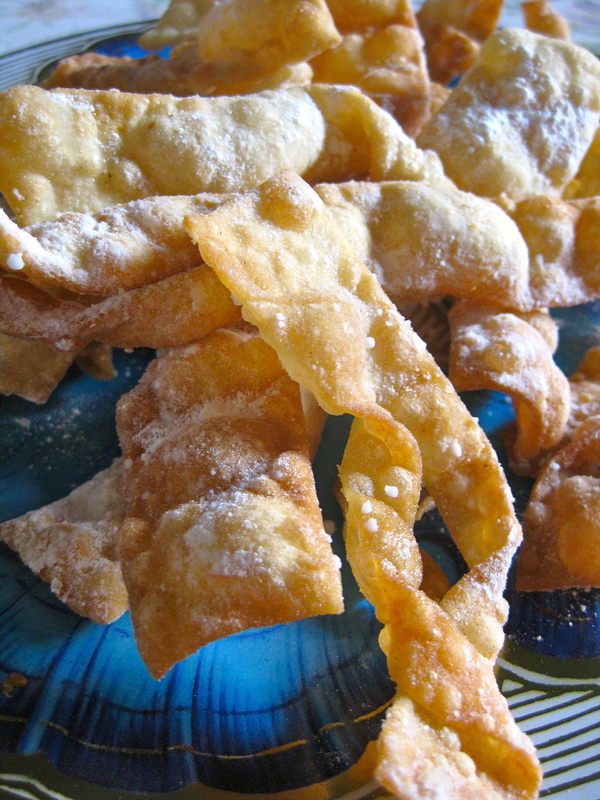 I daren’t make this recipe above, as with these delights, I simply cannot stop at one….They remind me of the Italian Crostoli, just too delicious! Thanks for passing that on Lyn, what a funny concept! And what a gold mine you stumbled upon in that recipe book. Hrstule are obviously the same idea as crostoli…they all have a similar name etc. But these ones are soooo good, and way better than those ones you get in the deli. More crispy. Definitely DON’T make these.